LabVIEW is an award-winning programming language that allows engineers to create "virtual" instruments on their desktop. This new edition details the powerful features of LabVIEW 8.0. 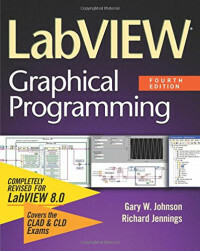 Written in a highly accessible and readable style, LabVIEW Graphical Programming illustrates basic LabVIEW programming techniques, building up to advanced programming concepts. New to this edition is study material for the CLAD and CLD exams. The setting for this book is the networked community. The treatment of the subject matter is broad and interdisciplinary, with contributions from computer science, sociology, design, human factors and communication technology.